Lawn Care is our passion! Leave the weekly mowing to the professionals! Spend time doing the things you love most and let our professional and seasoned team at O’Grady’s Landscape take care of your lawn in Brambleton, Virginia. At O’Grady’s Landscape, we take the stress out of lawn care with our Brambleton lawn mowing service. Our conscientious team is now serving the beautiful area of Brambleton, VA and surrounding areas in Loudoun County. We started as a mowing company over 20 years ago before blossoming into the full-service landscape company we are today—and it’s still at the heart of our business. When you choose us for lawn mowing in Brambleton, VA, you can trust you’re getting the best service possible, every time. We will provide you with weekly visits to ensure your property is polished and pristine and your grass maintains that vibrant green look you love. 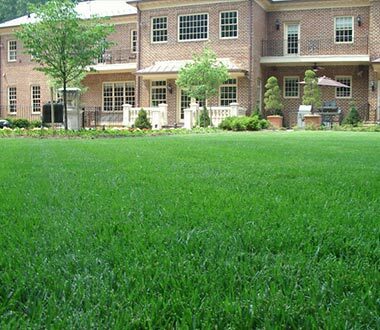 Let us eliminate the hassle of cutting the grass and improve the impressionable curb appeal of your home—call us at (703) 533-5001 to sign up for lawn mowing in Brambleton, VA.
At O’Grady’s Landscape, our first priority is getting your property looking pristine, and keeping it that way. That’s why we offer a comprehensive lawn care service that takes care of all your maintenance needs, from leaf removal to fertilization and everything in between. Lawn mowing is at the core of the process and is integral to having a polished, beautiful look and feel in your outdoor space. We make lawn mowing easy for Brambleton, VA homeowners—we set up a regular mowing day of the week and leave the rest to us! Interested in a comprehensive lawn care package for your property? We’ve got you covered! We can provide you with all the landscaping services you need to keep your lawn healthy, vibrant and strong. The care you give your lawn can make or break the look of your landscape. Overrun or dull and dead grasses can detract from even the highest quality landscape designs and the most beautiful hardscapes. Don’t let an unsightly lawn detract from your landscape when maintenance can be so simple! All you have to do is sign up for a regular lawn mowing plan with O’Grady’s Landscape, and we’ll make sure your grass is taken care of, on schedule and using the best techniques and equipment with qualified and trained personnel. We can even take care of any other services you need—from weeding to pruning to aeration and seeding and more—to make sure every detail is taken care of.